Forget television. 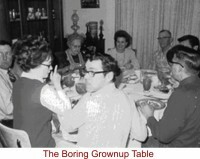 For entertainment, you just couldn't beat Sunday dinner at my grandmother's house. Especially if you were at the "children's table". I'll bet a lot of you know exactly what I'm talking about. If you had a great big extended family like I did, there just wasn't room for everybody to sit at the same table together, so the grownups ate in the dining room, and the kids were stashed away in the kitchen. The grownups may have had the good china and real napkins and meatiest pieces of fried chicken, but we kids had all the fun. Now I don't mean to give you the wrong idea about the way I was brought up or anything, but the truth is, at the children's table all manners went out the window! It was probably one of those "out of sight, out of mind" deals. As long as the adults got to eat undisturbed, they pretty much ignored what we were doing in the kitchen, which is a good thing, considering what was going on. My cousin Don, for example, could catapult a green bean off his fork and hit the floor furnace all the way across the room. My mother wouldn't have been very impressed, but I sure was. We told thousands of "little moron" jokes, too, like "Why'd the little moron blush when he opened the refrigerator? He saw the salad dressing!" At our table we had contests to see who could eat a banana in one bite, and we gargled our milk while singing, "Itsy bitsy teeny weenie yellow polka dot bikini". My mother wouldn't have been very impressed with that either. Once I actually ventured into the dining room to ask my dad if baby skunks really did stink when they were born like my cousin said they did, and I couldn't believe what I saw. The adults were just sitting there, talking about cotton crops and sandstorms. Nobody was turning their eyelids wrong side out. Nobody was standing carrot sticks up in their mashed potatoes. Nobody was tilting back in their chair, holding on precariously to the ledge of the table with one hand, while waving the other hand wildly around in the air for balance. The whole grownup scene was so depressing that I couldn't wait to get out of there. When I got back to the kitchen I told my know-it-all cousin that I was right about the skunks. He called me a liar, so I frogged him in the arm. Can an argument be settled this efficiently at the grownup's table? Certainly not. So considering all these fond memories of mine, you can understand why I was completely shocked at my own kids' announcement that they had outgrown the children's table at our family gatherings. "We're not babies any more, Mom", said my daughter. "And we're sick of listening to `knock-knock' jokes and having someone's milk spilled in our laps". My son agreed, "Yeah, the kids' table is totally lame. All we want is to sit and have a normal adult conversation with someone who doesn't have peas up their nose". And as much as I hated to admit it, they were probably right. After all, at this point my kids were teenagers, so it probably was about time that they joined the grownups. The problem was, there were too many adults around the dining room table as it was. Adding two more chairs wasn’t going to be easy. Not only that, but their departure would surely leave some empty places in the kitchen, too. What was I supposed to do about that? I'll tell you exactly what I did. I discussed the matter with my husband and he felt the same way I did. 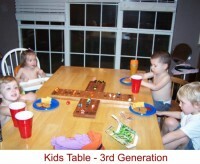 Occupants of the children's table should be selected not by their age, but by their level of maturity. So he and I switched places with our kids. Let them sit in that boring old dining room where they had to use correct forks and chew with their mouths closed. We headed out to the kitchen to have some fun. And let me tell you, we had a blast! We spent the whole meal hanging spoons off our noses and quacking our armpits. We even taught the other kids how to belch the theme to "Gilligan's Island". Forget television. For entertainment, it just doesn't get any better than that. Search for Around the Table articles similar to "The Children's Table. Search all articles similar to "The Children's Table".